I have been gone all week on vacation and didn’t realize there was a class tomorrow until tonight. I haven’t been able to make any of the blacksmith classes yet. The registration says closed. Yet it says open forge. Does anyone know if there will be room in the class? Yes, there are still spots in the class not sure why it closed early, but you are welcome to come, just bring a $10 cash donation, thanks! That is because you set a cancellation deadline; that is also a registration deadline. Please do not do that unless you have a good reason. You set the “Cancellation Window” field to 1 day. 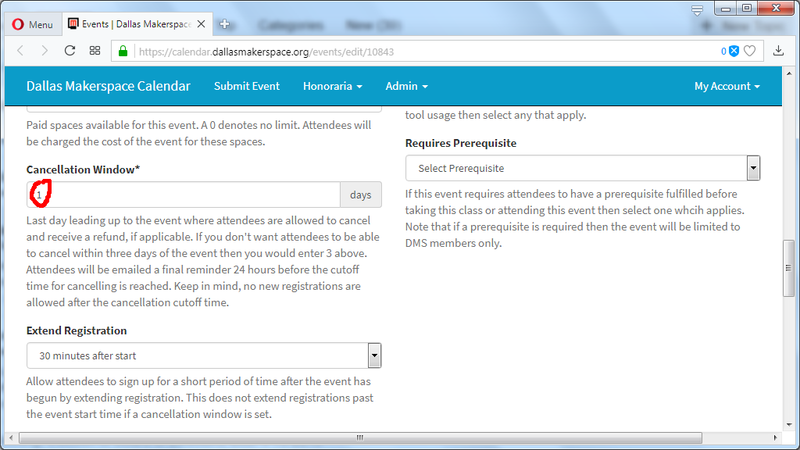 That prevents cancellations 1 day out, but also prevents registration 1 day out. That will eventually be fixed, but that is the way it works for now.